Mountains allured people since ever. Due to their inaccessibility early civilizations placed their Gods on their peaks. People have always lived in the mountains but during those times there were no certain worries to get on their peaks. The mountain environment proved to be a tough game of survival and natural resource exploitation; Mount Olympus was no exception to that general evolution. As the western civilizations begun to industrialize mountaineering was born and the request for adventure was spread on the steep cliffs and sharp ridges of the worlds high mountains. People dwelling on the mountains soon discovered a different type of game that included a strong dose of adventure as well as a number of objective and subjective hazards. Mount Olympus was no exception to that rule either. The first recorded ascent took place on the 2nd of August 1913 by the local goat hunter Christos Kakkalos together with the Swiss alpinists Frederic Boissonnas and Daniel Baud-Bovy. 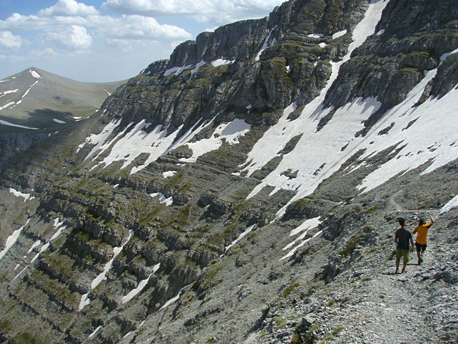 Since the 1960's mountain tourism evolved gradually on the trails and slopes of Mount Olympus. Ascending Mount Olympus in a single day is a rather bold task requiring big reserves of physical and mental stamina as the elevation gain from the parking lots (Prionia, Gortsia, Krevatia refuge) to the high peaks is in the order of 2000m. For this reason most of the aspiring climbers prefer to break the route in two days or more by spending one night in one of the refuges spread along the mountain. Climbers aiming for the highest peaks should follow the basic unwritten mountaineering rules, concerning the early start, proper gear and clothing, a thorough comprehensions about each route and the potential hazards involved and of course the forecasted weather. The "Zonaria" trail traversing under the couloirs of Mytikas (2918m) and Stefani (2909m) which are prone to rockfall especially after heavy rainfalls. Mytikas (2918m). 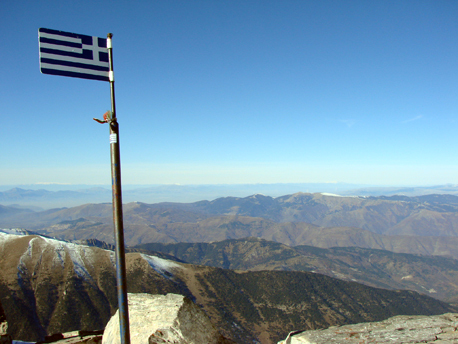 The summit of Greece.